Russo-Baltique Vodka offers Dartz Prombron Wagon as GIFT! shares news through our WOMAN of ACTION – Lorre White, the Luxury Guru. We believe this time, Lorre has outdone herself in this find. The following vodka must have a private laneway of its own to utopia; inviting the Ultra Wealthy to visit. Amazing! When one speaks of ‘spirits’, one thinks of a connection with the Divine. This spirit must have a direct path to Heaven, as shown in its pricetag! and get the Dartz Prombron Wagon free! The Russians sure know how to keep in the news. this time is the other way around! 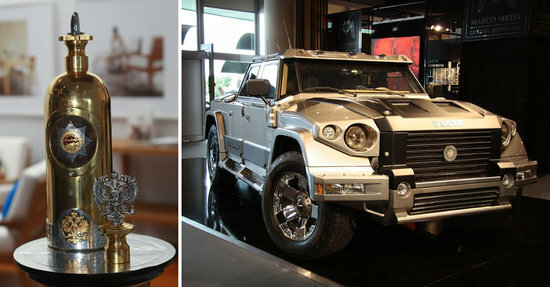 The most expensive vodka in the world called the Russo-Baltique offers the Dartz Prombron Wagon as a free gift. 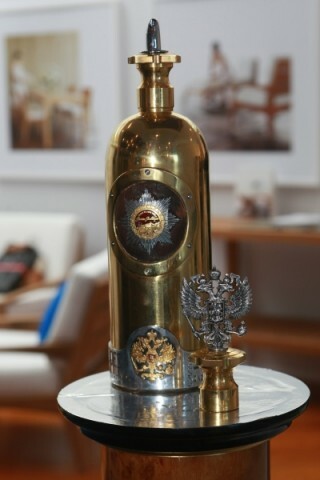 The Russo-Baltique, priced at $1.3 million The Russo-Baltique comes from Russia (no surprises here) and lays claim to being the worlds $1.3 million per bottle comes in a stunning decanter set in gold that recreates the radiator guard from the Russo-Baltique cars. And this is no ordinary gold, but metal that comes from gold coins minted between 1908 and 1912, when their first car surfaced. The flask will be capped with a white and yellow gold cap spotting a diamond-encrusted replica of the Russian Imperial Eagle. The bottle is crafted with 30 cm thick bulletproof glass. The Dartz Prombron is touted to be “one of the fastest multi terrain armored vehicles in the world”. It features parts made by General Motors and features a 8.1 liter engine under the hood. For LADIES ONLY … check this out. Dartz at the recent Top Marques Monaco made something safety-pleasure especially built for the ladies. Yes, as you can at the pictures, the Russian car builder presented its Prombron “L4P Ladies.Only” or, there is another name for it, Prombron “Iron.Diamond” — the limited edition Safety Utility Car (SUC) 999 horsepower three-door Kapsula Kupe featuring lots of luxury pleasures on inside; G-DEVICE by Viktor Poontoos for an example. And the last, as we also have mentioned earlier, this Dartz Prombron L4P Ladies.Only is a limited edition for just 10 units will be available for order. And now only 9 of those, the Princess Regina Abdurazakova from Kazakhstan has already ordered one. You gotta be hurry. DARTZ PROMBRON’ are happy and proud to present at Top Marques Monaco 2011 world first Safety Utility Car (SUC) created for ladies.only by ladies.only. 1. Kapsula body. Usually called “monocoque”. But as DARTZ used secret soviet armoring technologies, which are coming from Stalins time when we firstly maked armored kapsula for car driver and passengers and around it we build car. 2. As this car is created like personal ride for lady – 3 doors only. 2 front, and one passenger. 3. 300 mm shorter base – lady want elegant parking, but that’s not all for parking as…. 4. World first, specialy for DARTZ created by legendary TELEFUNKEN 8 cameras video system. 5. 999 horse powers – some like it hot! 6. TELEFUNKEN-LEIBOWITZ car audio-video-tv system – two legendary audio-tv marks are together again! In DARTZ! 7. Two color ultrasoft vintage interior. 8. White Gold Eagle badge. And, only for You ladies….Specially for You. 9. Minimum 5 skins You can choose for Your car – snake skin, crocodile skin, whale skin, chess skin, your choise skin, Buying one car – You get 5 colors! Availble ONLY at DARTZ! 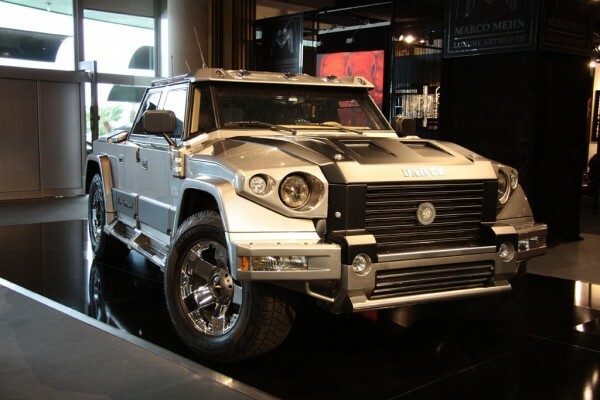 Aaaaaaaaaaaaaaand N10……..Designed by famous car designer, one of Yo-mobile designers Viktor Poontoos G-DEVICE! World Most Expensive RussoBaltiqe Vodka (that’s tradition with car more than Eur K500), Just.Drink.Edition. As Girls Need to relax! This limited serie is 10 cars only.